This entry was posted in Profiles by manish. Bookmark the permalink. The main reason I want to be hideously wealthy and famous is so I can turn down a knighthood (or at the very least, a CBE) and say “ABOLISH THE MONARCHY!” However I’ve learnt masses of people turn down honours, but the Palace make sure they find out well in advance so there’s no public humiliation for the gov’t and the Royals. Bah. I’m not specifically referring to Bhaskar, but since Blair arrived, the MBE, OBE and CBE have been so de-valued it makes me sick. Well it must be still pretty cool having a title before the name i guess…. 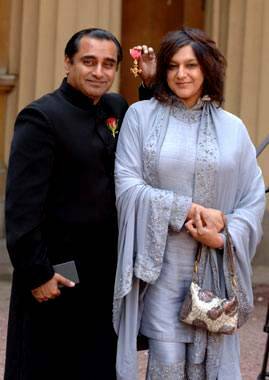 so does Meera become a dame by association?? First comes a peerage (“Lord”), then a baronetcy, then the knighthood (“Sir”). The CBE (Commander of the Order of the British Empire) is the most prestigious honour after a knighthood. The OBE (Officer of the Order of the British Empire) is the next most important award. The MBE (Member of the Order of the British Empire) comes next. Is it weird that he had a child with the woman who plays his grandmother? in some places in the caribbean they live for the annual queen’s birthday list honors and these obes, mbes. unfortunately everyone and their uncle is usually nominated for them and some truly questionable people are awarded them. Dholmatic, no one said he’s going to be a sir – bar dr1001 by implication. And I think she’s British. I want to turn down a KBE, which is what commonwealth non-British citizens get instead of a knighthood. e.g. Ravi Shankar, KBE. It looks cooler than all the rest, curse my British passport! Although…I do like the sound of LORD BREAKER. I still watch GGM to amuse myself – they’re still just as funny. I had the opportunity to watch Anita and Me – based on a novel written by Meera Syal. If you can understand/tolerate the Brommie accent, I highly recommend it. I am and I was being sarcastic….oh the brit humour…never mind. Oi, let’s be fair here. Manish initially wrote that Bhaskar was going to be a sir and that he was getting CBE. Maybe such corrections should parenthetically give props to whoever suggested the correction. dr1001, don’t try to take the ‘British sense of humour’ escape from an error. They get the British sense of humour here, they’re not rednecks. Unfortunately for you, I know you all too well (AiM). Oh I see, my apologies Papal and Dholmatic. Lord Breaker is wicked, but Baron Bong Breaker just sounds freakin’ legendary. I despise the British honours system, and would turn down every single one. Even the “commonwealth” writers prizes. They all prop up an immoral and otudated conception of leadership: monarchy. That said, I have to admit that there’s something vaguely scary and deep about the letters OM after someone’s name. That right there is the creme de la creme. Papal Mehta, OM. The Congressional Medal of Honor/ the Presidential Medal of Freedom just doesn’t give you the same vibe, does it? Manish initially wrote that Bhaskar was going to be a sir and that he was getting CBE. Actually I wrote ‘Sir Sanjeev’ and OBE. The Wiki article isn’t very clear about those silly titles (thanks, Dholmatic). Brit edits needed. i know you know me…otherwise i’d have changed my username. well whatever i’m happy for Sanjeev. If you get your hands on GGM on dvd, please watch the first episode of the first season – by far one of my favorite episodes. From the Delhi boardroom scene where they can’t pronounce the new guy “Jonathon”‘s name to the sketch where the Sikh guy is asking his parents to explain Sikhism to him and the whole basis for his identity as a Sikh and the only justification they can come up with is, “You are a man. You have a turban. So you are a Sikh man.” to the sketch with the Maharishi Yogi quoting Queen lyrics. I heart that episode. Really bad. Personally I’m more disturbed that he has a relationship with a woman who plays his grandmother. I agree Fuerza! And I think the boardroom scene IS the BEST of all their skits. I love the one where the desi parents are aghast that their kid doesn’t want to be an artist. Chick Pea posted this link a week ago about 104 year old woman marrying a 33 year old guy. At least the Kumar’s are merely acting- this s*** be real. Techniphobicgeek: I think that boardroom scene set the perfect tone for the series. The thing I loved about GGM was not only their sketches that forced non-desis to explore their own stereotypes about desis, but the sketches that also forced desis to explore their own ignorance about their culture, and “western” culture, as well as the sketches that were just good ol’ British “humour”. The folks at GGM made fun of e’rybody, including themselves. I read a really cute interview with Bhaskar when they got married, saying that he thought it was cool because at least he knows what Meera’s going to look like when she gets older! I found a website recently that has a lot of GGM clips. Funny stuff. There are too many superb GGM sketches for me to be able to list all those I really liked, although “Going for an English” is probably my personal favourite. From what I remember of the subsequent newspaper reviews here in the UK, apparently it was quite controversial because it was the first time that the tables had been turned and mainstream British television showed a bunch of desis ridiculing the white population (we’d all been on the receiving end of “humour” at the expense of desis for a very long time indeed beforehand). I loved the clip where the realty agent shows a home specifically tailored for Indians, gardens uprooted and concretised and sofa sets with their plastic covers intact. Bharat Homes, a pisstake of Barratt Homes. Bong…Baron Breaker is cool but Lord Bong has a ring to it. Kumars is one fabulous show – the one with Michael parkinson ( the very first guest, i think) was one of the best. i wish i could remember enough of GGM to compare and contrast. Kumars seems broader and gentler – but laugh out funny anyway. He’s shamelessly plagiarizing my look from the third movie! I cant get enough of this )) what have i been missing ,…!!! thank you thank you guys… the funny thing is i’ve seen some very very similar interactions take place at an airport. You should get hold of a copy of Meera Syal’s novel Anita & Me which the movie was based on. It was her first book and to me it is better than Life Isnt All Ha Ha He He which is a little bit too much chick lit for my liking, but still good in its own way. Anyway, Anita & Me is a sweet and funny novel about childhood, i reccomend it to everyone too. Sanjeev Bhaskar starred in a TV movie a few months ago about a shambling Indian private detective based in east London. It was really good – I think it is being made into a series. I believe you’re talking about Chopratown.